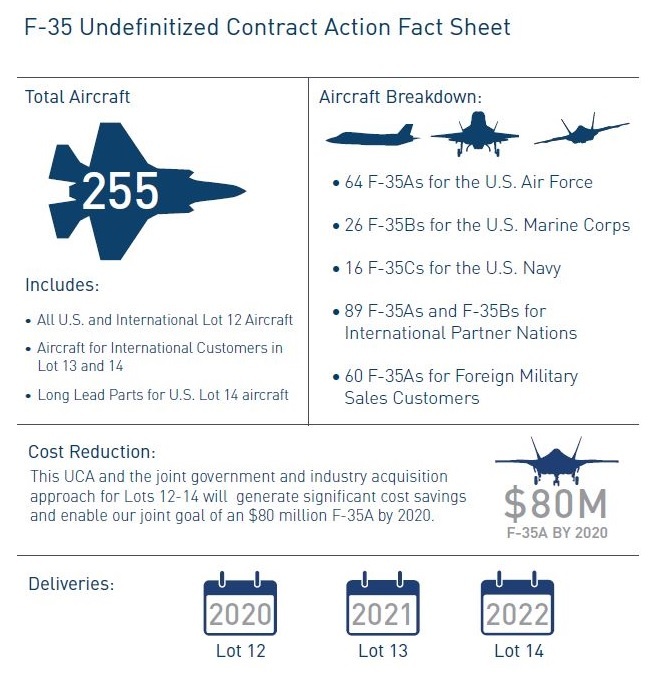 Lockheed Martin was awarded an initial $6 billion contract for production of 255 F-35 fighters for the U.S. and other countries spanning low rate initial productions lots 12, 13, and 14. The contract serves as a down payment on a deal that carries a $22.7 billion cap for Lot 12 aircraft. The 255 aircraft are broken down as follows: 106 aircraft for the U.S. (64 F-35As for the Air Force, 26 F-35Bs for the Marine Corps, and 16 F-35Cs for the Navy); 89 aircraft for non-DoD participants (71 F-35As and 18 F-35Bs); and 60 foreign military sales orders (60 F-35As). The U.S. portion of the deal is for the 12th production lot funded in FY18, which also includes 20 aircraft added by Congress that year (10 A models, four Bs, and six Cs), as well as the 16 aircraft added to the FY19 defense appropriations bill as part of lot 13. The FY19 plus-up comprised eight As, two Bs, and six Cs. For international customers, the contract covers aircraft in lots 12, 13, and 14 in an effort to lower costs through ensuring stable production rates. Contract negotiations for lot 12 aircraft are still being finalized, but Lockheed Martin said it is confident that lot 12 unit prices will be lower than the previous batch of aircraft. Unit costs for lot 11 were $89.2 million for the F-35A, $115.5 million for the F-35B, and $107.7 million for the F-35C. These figures include the cost of the engine. Lockheed still plans to reduce the cost of the F-35A to $80 million by 2020. Deliveries of LRIP 12, 13 and 14 aircraft will begin in 2020, 2021 and 2022, respectively.